You've probably seen the Pomato Plant advertised in gardening catalogs and maybe even wondered if it could possibly be for real. Well, it is and you can grow it yourself.The infamous Pomato Plant is nothing more than a graft of a potato and a tomato plant, both of which you can start on a sunny window sill in your home. So get out the potting soil, tomato seedlings, and a potato. You can use an ordinary potato from the grocery store, unless it has been treated to retard sprouting. From the way my potatoes begin to sprout, my guess it most have not been treated. If you are uncomfortable with using one from the grocery store, seed potatoes can be purchased from nearly any seed catalog. The tomatoes are best started in a shallow flat or even in peat pots. For an easier option, you can purchase peat pellets for a few dollars. They come in a flat disk of compressed peat. Simply follow the manufacturers directions to moisten the peat pellet. They will expand to create a nice little pot for your seeds. Place the pots on a tray and keep them moist. Place one or two tomato seeds in each pot. Seedlings will emerge in about a week. Find an old container large enough to hold you potato seed. An eight to twelve inch container that is at least eight inches deep will do the trick. If you intend to grow your pomato plant in this container, I would recommend getting a large bucket that will ultimately hold the growth of the potato tubers. You may even want to consider using a clear container to show off your potatoes. If you choose this option, it is necessary to cover the container with an opaque material for growing. The covering can be removed whenever you want to check the growth of the tubers or show it off to your friends and neighbors. If you have a small potato, then by all means plant the whole potato several inches deep; otherwise, cut a section of the potato that contains several eyes and plant that. Your potato will take longer to sprout than your tomato seeds. It will generally take about two weeks. Be patient. It will sprout. Start at least two to three potatoes in separate containers. In the event that your first graft fails, you will have another rootstock ready to work with. Make sure you have several tomato plants as well. When both your tomato and your potato plant are 8 - 10 inches high (this will take several weeks), you are ready to graft them to make your pomato plant. Place your plants side to side so that their stems can easily reach each other. You may need to elevate your tomato plant so that the base of your plant is parallel to the stem of the potato plant. You are about to graft the top of the tomato plant (the scion) to the bottom of the potato (the rootstock). A side graft is the easiest and safest way to do this. You will need a sharp knife or a razor blade and grafting tape. Carefully slice into the tomato stem at the point where you want to make the graft. Cut a very thin sliver (no more than 1/3 the thickness of the stock) of the stem of the plant. This should be no longer than an inch. Be very careful not to slice all the way through the tomato stem, as you want your tomato plant to continue to receive nutrients from its own root system until the graft is final. Repeat the process with your potato rootstock, again being careful not to sever the plant completely. Gently bend the two stocks and place them so that the area you have just cut matches up as closely as possible. Wrap the grafting tape around both stems to hold them securely together being careful to cover all open areas. Set your plants in an area out of direct sunlight and keep the soil evenly moist. Watch for new growth on the top of the tomato plant and a slight bulging at the site of the graft. Cut away the portion of the potato above the graft site, once it has completely healed. When the tomato again shows a spurt of vigorous growth ( 2- 3 weeks) cut away the portion of the tomato plant below the graft. Enclose your plant in a clear plastic bag for several days to maintain moisture. If your plant shows signs of wilt when removing the bag, replace it for several more days. Again watch for a spurt of new growth. When this is observed, you can remove the grafting tape. Handle with care, the site may still be fragile. Remove any new growth from the rootstock (potato) as it grows in. Otherwise the potato will outgrow the tomato and overwhelm it's growth. You have just created your first Pomato Plant. 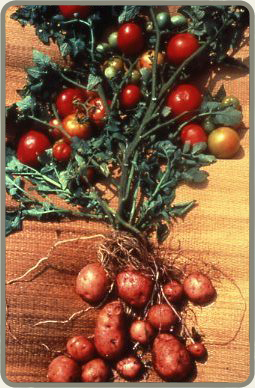 With proper care, your new plant will produce both tomatoes above ground, and potatoes underground. I am told that you can transplant potato plants from your container to the garden, but I've have never done so myself. I'd recommend growing your pomato plant outside in the bucket. But, harden it off first by setting it outside in a sheltered area for a few minutes each day. Gradually increase the amount of sunlight and wind exposure each day until your plant is ready to stand up to the elements on its own.